Receive 15% off your initial cleaning. Limit one per customer. Must present coupon for redemption. May not be used in conjunction with any other offers. 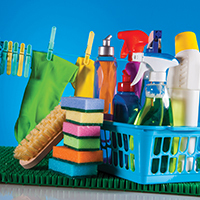 We try to customize each cleaning per the specific needs of each customer. Typically we provide all cleaning supplies and equipment except trash bags. But we do collect trash from every room we clean and take it to your dumpster if requested. Estimates are given freely. We prefer to do on-site estimates of services because then we know what type of cleaning supplies or chemicals will be needed to accomplish the tasks requested.